Atlanta, Ga. – Major improvements are afoot at Lake Burton Club, a Reynolds Club Community, located in the North Georgia Mountains. The private mountain lake retreat of 240 homes and homesites nestled on 350 pristine acres around Lake Burton offers panoramic views of majestic mountains, turquoise lake waters, and lush forests. Lake Burton Club’s 52,000 square-foot Athletic Center, which houses an indoor swimming pool, indoor tennis and basketball courts, European spa, fitness center, Pro Shop and more, is being renovated to enhance the overall club experience for members. Highlights of the Lake Burton Club renovation include the club’s designer-stocked pro shop that will be relocated and enlarged, featuring windowed walls with panoramic views of the lush green fairways of holes No. 1 and 18, as well as the lake that separates them, and the mountains beyond. Other work includes a complete makeover of the sales center that will feature new lighting and gallery displays depicting the character, quality and lifestyle of Lake Burton Club. Members also can expect a new dining room, The Grille, which will adjoin the existing 19th Hole Cafe, and offer a casual dining experience from a new full-facility kitchen. Also, the existing lanai, which overlooks the practice green and the 18th green, will be expanded to include a relaxing rocking chair porch, where members can gather to watch the final putts of important matches or simply enjoy the forever views. Renovations will be completed by early April, in time for two weekends of grand opening festivities including a ribbon-cutting ceremony for the Athletic Center, a high-performance car show, an Art Auction benefitting a local charity, and the Lake Burton Club Tour of Homes. 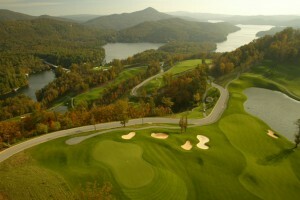 Lake Burton Club is offering a special incentive of 15 percent off developer-owned homesites priced above $145,000, from now through April 30, 2011. Nestled onto 350 pristine acres offering panoramic views of majestic mountains, turquoise lake waters, and lush forest, Lake Burton Club is a private retreat of 240 homes and homesites with incredible views of the lake, mountains, golf course, or all three. Affiliated with the developers behind acclaimed Reynolds Plantation, Lake Burton Club offers recreational activities ranging from a championship bentgrass golf course from tee to green, indoor swimming pool, and fitness center, to indoor tennis courts, indoor basketball courts, and a European spa. Lake Burton Club offers private access to Lake Burton with a dedicated water sports program, which includes boating, fishing and skiing. For dining and entertainment, The Lodge offers fine and casual dining, a covered fireside Burton Porch, lounge, theatre and private meeting rooms. Members can take in the vistas of three picturesque states from The Lodge, which sits at 2,700 feet.